Truly Global’s exploration of the intersection of business and culture is fascinating and thought-provoking. 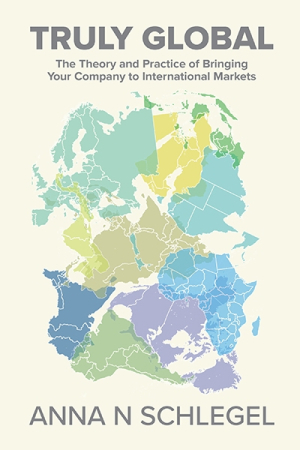 Globalization and language expert Anna Schlegel has written a short and effective handbook outlining the key steps that corporate organizations should take to successfully integrate into international markets. Truly Global is succinct and punchy and may prove invaluable for business leaders around the globe. The book is geared toward business managers, directors, and executives who need a bridge from theories of globalization to real-world corporate practice. Twenty-two pithy chapters construct this bridge, relaying general outlooks of the newly interconnected world and best practices for taking products to new markets. The text’s brevity works both for and against it. Some passages are short to the point of dryness, relying on business acronyms that tend to sterilize the prose. Structurally, chapters explaining the business concepts of localization and internationalization are undermined by their placement in the back of the book, when they might have been used more effectively to preface initial discussions on the two terms. But these problems are in no way deal-breakers. The prose mostly shines. The best writing occurs when the author invokes her own experiences as a world traveler and corporate translator. The prologue, for instance, delightfully describes Schlegel’s upbringing in multicultural Europe and the cosmopolitan ethos that informed her unique multilingual skill set while working with corporate heavy-hitters like Cisco. Besides this richness of personal experience, a charming optimism and can-do spirit come through in several chapters, bolstering the more technical aspects of the book’s globalization philosophy. Consistently helpful are bolded, bulleted sections of each chapter that highlight important topical points and practical applications. Underlying these specific points is repeated emphasis on cultural awareness. Indeed, the main argumentative thrust is toward a better understanding of different cultures. It’s a bit paradoxical, though. Businesses need a streamlined international infrastructure in which to distribute product, Schlegel argues. This infrastructure, however, has to be adjustable at the local level, so that the product, its descriptions, ancillary services, customer support, and vendors are all aligned to the specific local culture, language, and mores. This concept of “geo alignment” and related topics puts the volume on the cutting edge of business strategy. Schlegel is herself a pioneer in spearheading globalization efforts in major companies. Her forward-looking global outlook and perspicacious yet practical advice will undoubtedly benefit business leaders and executives of firms both big and small. On a different level, however, Truly Global’s exploration of the intersection of business and culture is fascinating and thought-provoking. The book stands to appeal to anyone interested in economics and international relations.